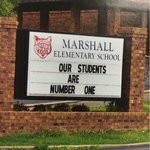 Marshall Elementary School is in Lewisburg,Tennessee. It houses the second and third grade students that reside in Lewisburg, which is the county seat of Marshall County. The principal is Bonnie Reese, and the assistant principal is Nicky Randolph. The enrollment is approximately 455 students. Oak Grove Elementary students, grade K-1 feed into Marshall Elementary. MES feeds into Westhills Elementary School, grades 4-6.
technology, academics, and social activities.